So, I was super thrilled to be picked for the Clothing at Tesco Plus Size Panel... What's that?! I hear your cry... OK maybe not cry, but you curious, sure! A small panel of bloggers will get sneaky peaks of the new plus size ranges offered by Clothing at Tesco, let Tesco know what we think about them and best of all get to share them with you and maybe a few treats for you guys too... Oooooo! For those of you not familiar with Clothing at Tesco and their plus size ranges, the regular line runs to a 22, they also carry Ann Harvey and then there is the True range which runs from 16 - 28. I'm not going to lie, I found the range a bit uninspiring, they had the odd gem, but it did consist mainly of basic separates in a plain palette. Well, no more! These new pieces for A/W are shaping up to be much more exciting, bold prints and strong colours. When Tesco came to talk at Plus North what excited me most was that they really want to listen to the Plus Size woman, hear our ideas, shape the range to us. It's a bold move for a company to turn around and admit they can do better and that the customers input is key. So what does the new range look like? Does it inspire you to shop with Tesco? Do you think it's an improvement on the the old True collection? Let me know in the comments section, and be honest, Tesco want to know what you think so they can keep on improving the range. Me? I think it is a definite improvement on the previous ranges, it's nice to see some bold prints and figure fitting silhouettes. I personally think there is a way to go, but I really shouldn't pass judgement until we see the rest of the range. My only criticism is for a range in sizes 18-28 I would have liked to see a size 18 (at least) model, if she is, I'll eat my fat hat, but I have a feeling she's more a 14. Which is a shame. But it's a very promising start and I think you'll agree the price point is fantastic! The new range will start appearing online within the next few weeks, I'm looking forward to seeing what other pieces they ave in store for the True range. To be honest, its pretty dull. Tunics and leggings - yawn. I like the stud jacket but I can't see any of the A/W12 trends - leather, baroque, oriental...Sorry to not be more positive but its just more the same. Totally agree with you in terms of the trend, I would have liked to see a really nice fitted leather jacket in there. Fingers crossed the rest of the range delivers! I was going to write exactly the same as Claire, so I won't bother adding much other than I wouldn't buy any of it, its boring safe and dull. Sorry Tesco, but you have some amazing stuff in your other sized ranges, why not make the sizing bigger, if you go to a 22 anyway, why not just extend by another 4 sizes? A step in the right direction, I guess. But, there is still a lack of something more fitted / tailored. What is so wrong with clothing which hugs those luscious curves? This I like. Great feedback! Mmmh...Apart from a couple of items, it looks frumpy and terribly synthetic to me - sorry Tesco. It doesn't help that the last dress is about 2 sizes too big for the model (who is a size 10/12 or I'll eat my hat). So yeah, it's a definite "meh..." from me! I'm loving everyone's feedback, and I love that no one holds back! Go for it girls! its a definite improvement on past seasons, i really like the look of the Stud jacket, purple jeans and the lace dress. it would be nice to see the clothes on a "real" woman, it's be nice to know what the fabrics are for the garments. i tend to get electric shocks just walking round my local Tesco's clothing department! saying that it doesn't stop me from buying. LMAO @ the electric shock comment. I know what you mean! Thanks for your feedback Stefi, I think this will be invaluable for Tesco! ill never understand why most plus size ranges dont have the same items from the 'normal' range just bigger. why should bigger people have to wear frumpy, boring clothes while smaller people have really nice things? us bigger folk like to look good too! maybe tesco should take a look at asos curve and ax paris curve..
An imporovement for sure, i still find the tops a bit shapeless and dare i say boring? We need more tailored, form-fitting clothes and more fashion forward please! This seems to be aimed at an older market. But im so pleased that they care about improving the range, thats excellent. It's true, this model is gorgeous, but only a size 12 surely! I'll never understand the point of putting plus size clothes on models that couldnt even buy the clothes because theyd be too big. Wonderful! And for 20 pounds you cant go wrong! Thanks for the reply. x (PS looove the blog and get a little thrill every time a new post from you turns up on my bloglovin feed lol). Well it is all a bit underwhelming isn't it? Lots of black and shapeless items, not a single item I would but for myself. It all seems a bit old and boring compared to the regular clothes at Tesco, which is really disappointing as I was really excited by what they had to say at Plus North, I though "finally, a brand that seems to get what we want"... Apparently not. Sometimes brands think plus size = classic, old style but I'm 24, young and I want dress myself like a 10 size. Not innovative ok but I like the pieces! They have a good price too! When I'll be in London I'll go to Tesco's to try something for sure! As everybody has said the clothes are not very fitted, although I do like some of them. I would also like to see these on a much bigger model ie moi lol. I think retailers also need to understand that Winter does not mean black , white and grey. I personally would like to see brighter colors. It looks good but you're so right about the model - she's certainly not a 16. Anyway, my wishes... I love their leggings but my store never has any size 22's, I'd like to see the plus range mirroring the standard range more and please, please, please can we have some pyjamas? Please? I dont really have much to add to what has been said but as always i will pipe up anyway. Tesco have some really lovely pieces in the core range (for all the family) but i really wish they extended the same pieces to the plus size range. Surely it's up to us to decide what suits us at each size. Im in total agreement with thefashionsideofme - i want to dress like my size 10 25 year old counterparts. It gets frustrating walking round Tesco when my daughter (5) can get more on trend pieces than i can. Before I go on a rant, this isn't about the model, becuase she is a hotty, but it's so hard to see what the clothes would look like because they are WAY too big for her. Along with M&S, Tesco are the worst for this and even their standard size clothes tend to be modelled by women two sizes smaller than the dresses. In case anyone from Tesco takes notice - it's actually insulting, and they really aren't doing themselves any favours because they clearly don't believe they can make these clothes look good on a genuine plus size woman. I find the photograph of the black dress laughable, and as a photographer I feel sorry for whoever had to try and make this look acceptable! As for the clothes, I'd say they were generally a bit boring. Coloured jeans yes, but while regular size girls are getting exciting patterns and neon brights, plus size girls are still stuck with dowdy dark purples and teals. The only thing I'd wear from this collection is the first top with the tree branch print - really striking. Thank you all so much for your comments, I think you've all made some really valid points, and I think the moral of the sorry is, we don't want anything special, we just want what our thinner counterparts have, but in bigger sizes.. Simple huh? I love the outfit in the second pic and it's really cheap too! 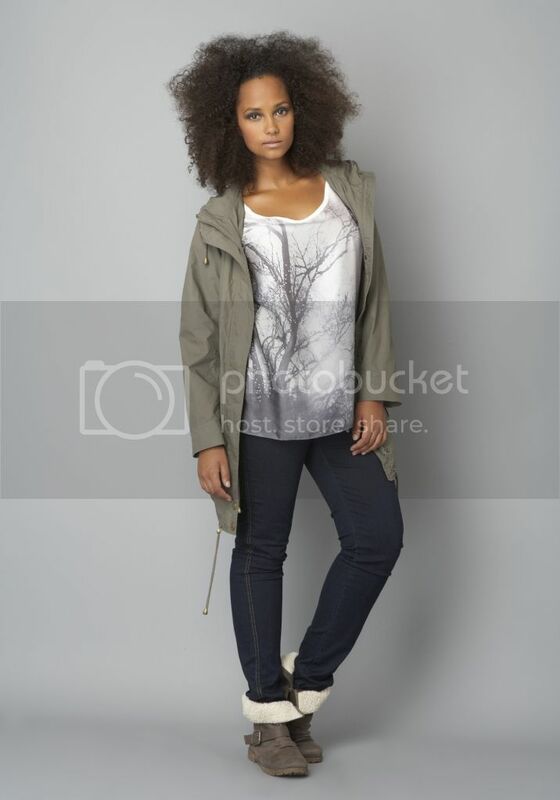 The Tunic with the big round print is amazing, great pick. They've definitely got my attention with these outfits. Very nice! Some of the leggings colors are not my favorite, but in general these are all great styles.